Kokone should be diligently studying for her university entrance exams, but she just can't seem to stay awake. Aside from stealing precious study time, her napping is even more distracting, as it brings on strange dreams with warring machines that hint at family secrets that have been dormant for years. She can't ask her father, a hipster mechanic more talented and artful than his job requires. What are these visions that lead Kokone at once closer to and farther away from her family? Like all the best works, the series revels in multilayered fantasy to show how sometimes opposites—waking and dreaming, the past and the future—are far more intertwined than they appear. 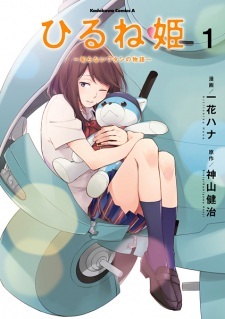 Hirune Hime: Shiranai Watashi no Monogatari was simulpub in English as Napping Princess: The Story of the Unknown Me by Yen Press since March 10, 2017.